I made these Kid Friendly Homemade French Fries a few weeks ago and they were a huge hit with Jillian! She loved being able to hold them herself and the soft texture of the french fries made it easy for taking small bites. I am always trying to find healthy alternatives to kid friendly foods and this has been my favorite so far! No frying, just wholesome baked goodness. Enjoy! Cut the potatoes into 1/4 Inch Strips. Place the cut potatoes into a microwave-safe dish with the water. Cook on in the microwave for 5 minutes on full power. Drain off liquid, and toss with salt, pepper, and olive oil. Arrange fries on a baking sheet in a single layer. I make roasted potato cubes frequently. I'll have to try cutting them into french fry shape, microwaving first, and using a touch of seasoned salt like you've described. They look great! I do this a lot, too - so yummy! 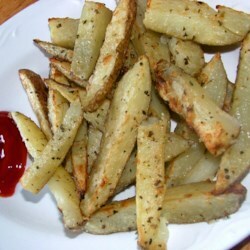 Homemade french fries are one of my favorite foods ever! I haven't made them in awhile & I normally fry them. I'll have to try baking them especially since I'm trying to eat better. Yummmm. SO much better then fast food fried ones! I need to do this again. Thanks for reminding me. Yum! The fries sound delicious Karen. I love the idea of the soft texture and of course no frying. These sound so delicious and I can't wait to try them out on my kiddos...if I actually end up sharing them! :-) Thanks so much for joining us for Inspiration Friday! Found you through the April Blog Hop at Bloggy Moms. These fries look delicious! I will have to try them; I'm sure the little people at my house will love them.